[Stride]-Stride Step-[Choose one or more cards with the sum of their grades being 3 or greater from your hand, and discard them] Stride this card on your (VC) from face down. 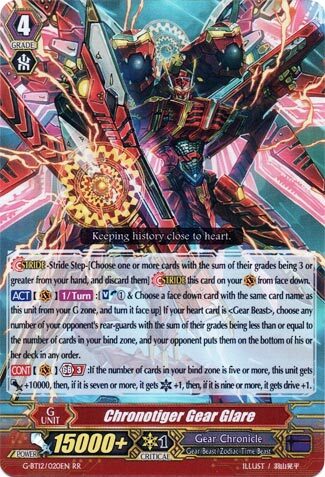 [ACT](VC)[1/Turn]:[Soul Blast (1) & Choose a face down card from your G zone with the same card name as this unit, and turn it face up] If your heart card is , choose any number of your opponent’s rear-guards with the sum of their grades being less than or equal to the number of cards in your bind zone, and your opponent puts them on the bottom of his or her deck in any order. [CONT](VC) Generation Break 3:If the number of cards in your bind zone is five or more, this unit gets [Power]+10000, then, if it is seven or more, it gets [Critical]+1, then, if it is nine or more, it gets drive+1. Oh sweet, board wipe. Something Chronojet doesn’t do very well without BIG G-Zone allowances. This is of course more useful the later in the game it is, but even three cards in the bind zone can kill a column worth of cards (a Grade 1 and 2, with any 0s as a bonus). 9 cards in the bind zone is going to be tricky, but as long as it’s centred around Demiurge, Chronofang or even both, it should be doable as a second Stride. Shame that the extra Drive Check is the only thing that makes this not redundant as a Late Game option outside of horrible board activities. And that focusing the build on the GB3 makes it terrible. GB3 has no heart requirements. Use that to your advantage in Demiurge. Keep in mind it’s not consistent and Rebellion will usually be the better Chronotiger to Stride into.